It's hard enough getting kids to do their homework without a designated space for them to do it in. Kids are often distracted by the television, are bored after a long day at school and are restless. Running outside and playing with the neighbourhood kids is far more appealing than timetables and geography. The trick is to create the ideal child's study area where inspiration will strike, creativity will flow and effort and hard work will manifest. With the right colours, perfect desk and the most comfortable chair, a child's study area can be transformed into a space of productivity. As Wynton Marsalis said, I believed in studying just because I knew education was a privilege. It was the discipline of study, to get into the habit of doing something that you don't want to do. Follow these six great tips to create the perfect child's study area. Kids' bedrooms in general store a lot of items and a child's study area is no exception: textbooks, school books, stationery, pencil bags and calculators all litter the space. 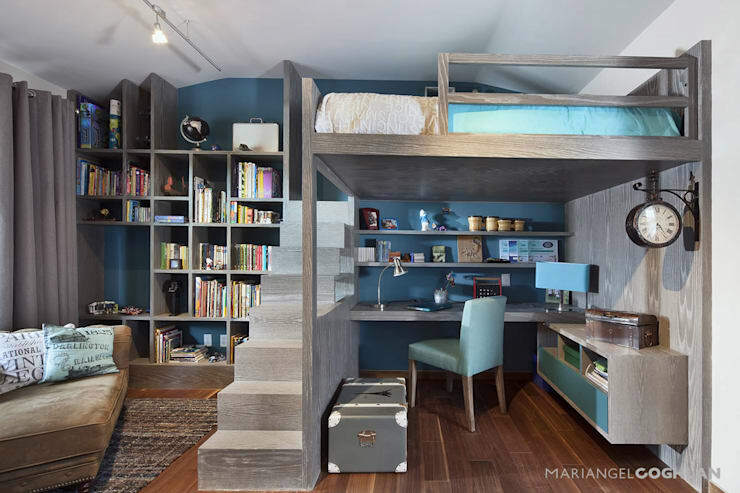 Smart storage is the only way to ensure a child's study area is functional while remaining stylish. Drawers are the first must when it comes to a child's study area. Pack stationery, pencil bags, study notes and calculators neatly away so they don't end up sprawled across the desk. Drawers can be painted bright, funky colours to fit into the theme of the bedroom. Bookshelves are another must, storing books and files neatly as well as making use of vertical space. Hang shelves up yourself or invest in a sturdy bookcase. Space is often an issue when it comes to modern day homes, which is why storage is so important. If you are still struggling with space, check out: Simple Ways To Make Your Home Feel Bigger. Studies have shown that colours promote different types of psychological reactions including emotions and moods. So what are the best colours for concentration? Blue is one of the best colours to go for when it comes to being productive and concentrating on academic work. According to psychologists, blue is a soothing colour for the mind. This is the colour that evokes strong, focused thoughts as well as a sense of calm and serenity. Orange has also been said to inspire creativity and productivity, evoking warm feelings and emotions. Psychologists also claim that it's a fun colour, but it shouldn't be used together with black. Yellow, which makes up the colour orange, is said to promote creativity according to psychologists. Said to stimulate optimism, this is the colour to use when your child is working on an art project or is writing an English essay. It's the colour that gets the creative juices flowing. No matter which colours you choose, you still want them to fit into the theme of your child's bedroom. If blues, oranges or yellows fit into the theme, then go for it and paint the walls. If this isn't an option, include the colours around the study area with wall paper, cushions and accessories. You can even paint the desk or surrounding shelves. In order for a child to be productive in his or her study area, there needs to be a level of comfort. A good quality table and chair is key, while ergonomics are also important to consider. In terms of comfort, opt for a desk that is made from a good, strong wood. Do some research into the types of desks out there before choosing one, weighing up your child's age as well as the space available for the study area. The desk should be one that lasts a good few years—from primary school well into university days. Don't go for a desk that is too high either, it needs to be suitable for a child. Chairs add a fun, trendy and often colourful feature to a child's study area but it should be a comfortable place to sit. A chair that adjusts in terms of height is a good idea—your child will experience growth spurts over the next few years. His or her bum shouldn't go numb sitting on it either. Opt for one that is cushy or add your own cushions to it. A child should be comfortable while studying, neither too hot nor too cold. Temperature is an important factor to consider, especially during the different South African seasons. Natural light will be discussed next, but it's worth noting here too. Natural light that streams in through skylights and large windows will help to keep a room warm without any methods of artificial heating. This is a plus in winter. In summer, opening the windows will help to maintain the natural temperature, while cooling the room down. In the very hot months a ceiling fan or even a desk fan can also help to cool the room down. Installing an air conditioning unit is also an option, which blows cool air in summer and warm air in winter, but if possible, opt for more natural climatisation methods. Underfloor heating can also work to gently warm a room. The main aim is a temperate room that doesn't get too hot or too cold. Lighting is incredibly important in a child's study area—you don't want them to be squinting over their books or being blinded from the glare. A good balance of natural and artificial light is the way to go. Natural light is not only healthy but it contributes to a more sustainable, eco-friendly house. 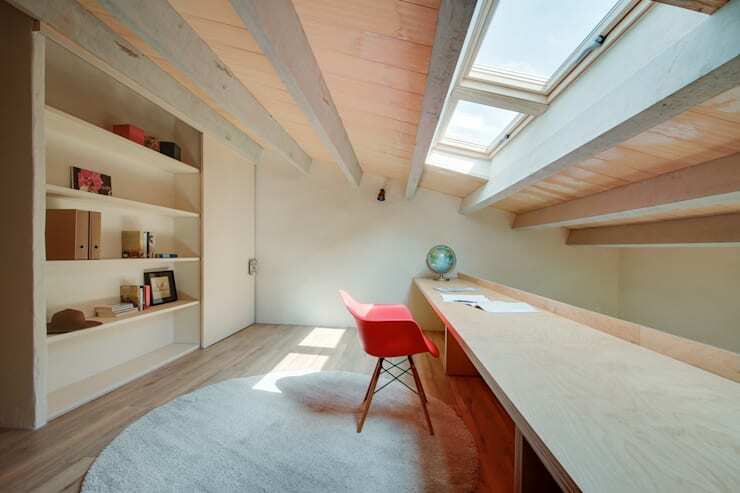 Include a skylight near your child's study area as well as a large window or two, filtering in as much sunshine as possible. This will also keep the room naturally temperate. Artificial light is useful in the form of a desk lamp, illuminating the details of whatever book or study note is on the table underneath it. Desk lamps come in funky colours and styles and are an opportunity to really make a study space trendy. See these cool lighting ideas for study areas. Ceiling lights are also important for a study area, especially when it is dark outside. Opt for a few that will had a warm, soft light to the room without leaving the room too dark. Being distracted is one of the main issues when it comes to children studying. A toy or a television show jumps out at them while they sit at their desk, which is far more entertaining than homework. The position of the study desk is the first aspect to consider. If the desk faces the wall or the garden outside, the child is less likely to look around their bedroom and have their attention drawn away. Place motivational posters in their line of vision too, encouraging them to get back to work and to do their best. Removing the television, mobile phones and electronic tablets from the study area and having stricter rules around their use will also go a long way in terms of distraction. Kids shouldn't be worrying about who is texting them and what's going on all over Facebook while they are studying. Good nutrition is also key for kids and their concentration. Ensure they are hydrated with plenty of water and that they eat plenty of fruit and vegetables. Encourage them to stay away from sugary snacks that will pick up and then dramatically drop their energy levels. 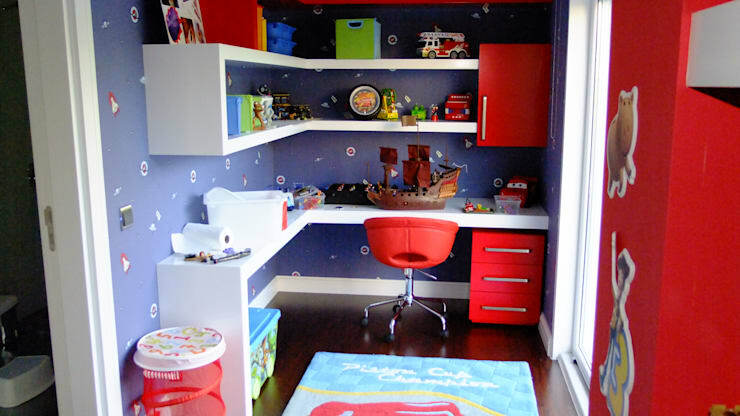 Creating a child's study area, such as the one pictured here by Elements, should be fun for both you and them. Ask them to help you pick out furniture and colours to they too feel that they've invested in their space of hard work and studying. Does your child have a good place to study? Let us know!